Electrophoresis, also known as cataphoresis and anaphoresis, is the motion of colloidal particles suspended in a fluid medium, due to the influence of an electric field. Breaking that definition down, in chemistry, a colloid is a mixture of insoluble particles that are suspended throughout another substance. For instance, milk is an emulsified colloid of liquid butterfat globules dispersed within a water-based solution. To qualify as a colloid, the mixture must be one that either does not settle or takes a very long time to settle. Add electricity to the equation, and you’ve got electrophoresis. Electrophoresis is a technique used in laboratories in order to separate macromolecules based on size. Gel electrophoresis is a biochemistry technique for separating protein molecules of varying sizes in a mixture by moving them through a block of gel by means of an electric field, with smaller molecules moving faster and farther than larger ones. Electrophoresis units are research tools designed for DNA, protein, and nucleic acid applications, and they are constructed for molecular biology and bioresearch laboratory and classroom settings. Gel electrophoresis technique is used in DNA fingerprinting, for instance, and other processes in which large molecules are to be identified. Fragments of DNA are placed in a gel and an electrical field is turned on. The fragments move in response to the field, with smaller fragments generally moving faster. After a time, the fragments have separated enough to form a series of separated lines that become like a barcode that characterizes the DNA. As modern as electrophoresis sounds, it actually has roots that go back as far as the late 18th and early 19th century. Early work with the basic principle of electrophoresis was based on Faraday’s laws of electrolysis and other early electrochemistry. In 1807, a Moscow scientist noticed that the application of a constant electric field caused clay particles dispersed in water to migrate. It is the presence of a charged interface between the particle surface and the surrounding fluid that causes the migration, and this has become the basis for a number of analytical techniques used in chemistry for separating molecules by size, charge, or binding affinity. Experiments by scientists of this era to measure the properties and behavior of small ions moving through aqueous solutions under the influence of an electric field led to general mathematical descriptions of the electrochemistry of aqueous solutions. Equations were created for varying concentrations of charged particles moving through solution, including sharp moving boundaries of charged particles. Methods of optical detection of moving boundaries in liquids were first developed in the 1860s. This method, combined with the theoretical and experimental methods for creating and analyzing a charged moving boundary, would form the basis of the modern moving boundary electrophoresis method. By the start of the 20th century, electrochemists had found that such moving boundaries of charged particles could be created with U-shaped glass tubes. Based on these early experiments, Arne Tiselius developed the Tiselius apparatus for moving boundary electrophoresis which was described in the 1930s in a paper entitled “A New Apparatus for Electrophoretic Analysis of Colloidal Mixtures.” This method spread slowly until the advent of effective zone electrophoresis methods in the 1940s and ‘50s, which used filter paper or gels as supporting media. By the 1960s, increasingly sophisticated gel electrophoresis methods made it possible to separate biological molecules based on minute physical and chemical methods, such as protein fingerprinting, blotting procedures, DNA sequencing, and much more. New separation processes and chemical analysis techniques based on electrophoresis continue to be developed into the 21st century. For the very best in electrophoresis equipment at the best price, turn to NextDayScience. 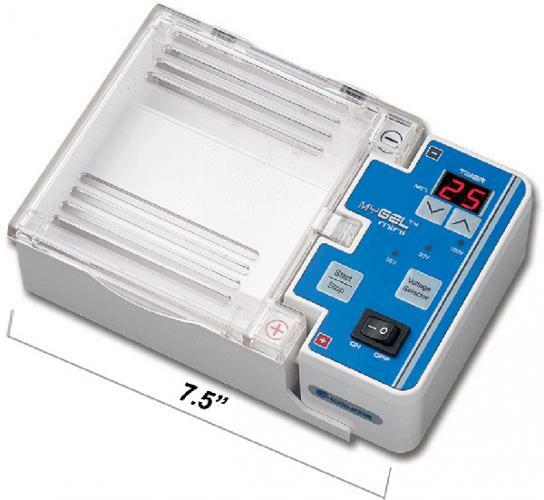 Learn more about the electrophoresis units and accessory equipment for sale by visiting our NextDayScience website or calling 1-866-650-0314.